“OMG, that’s so clever, so earnest, so simple, but so darned good.” That is almost always my reaction when we or someone in our office discovers another simple provincial delicacy or recipe that isn’t so common in the city anymore, and which I feel like we should all do something to save it from possible extinction. That’s the way I felt when I discovered buri cakes (the flour made from the central pulp of fallen buri tree trunks) that I have been hunting down a source of the flour for years to no avail, or the way I felt with my day with Manang Lima over 8 years ago when she taught me how to make her budbud kabog, or most recently today when I was shown how to make this simple but enchanting cassava cake. From the moment I was shown the cooking vessel, I knew this was something long-time readers would want to probably read about. 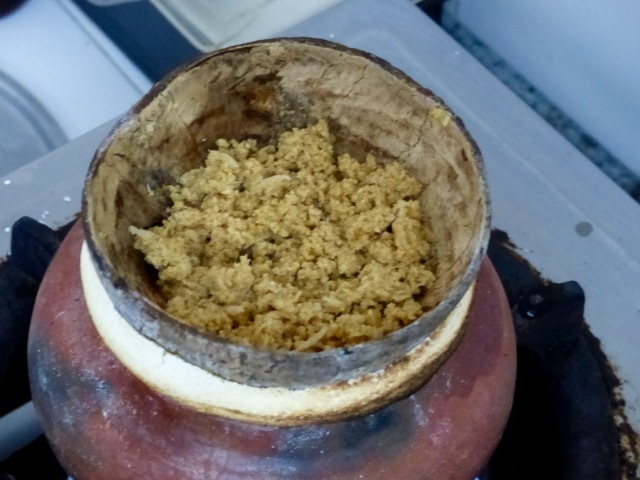 I am just posting the process first, as we aren’t totally happy with our version yet, and I do hope to be able to offer this in stores so that if people try it, buy it, and we continue to make it, maybe it will stay in our current list of local kakanins rather than falling off to the way side… Start with good cassava root, peel and rinse well. Pass it through the grating mechanism of a food processor (you can certainly hand grate if you prefer), then squeeze out the liquid and sift repeatedly through a large then fine gauge sifter. 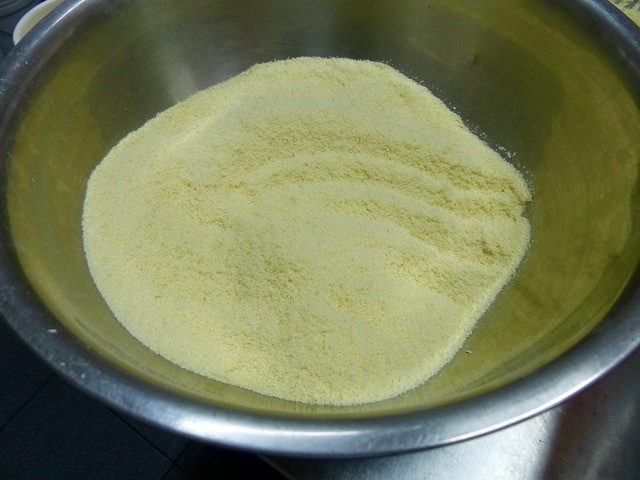 You end up with really fine damp cassava flour. 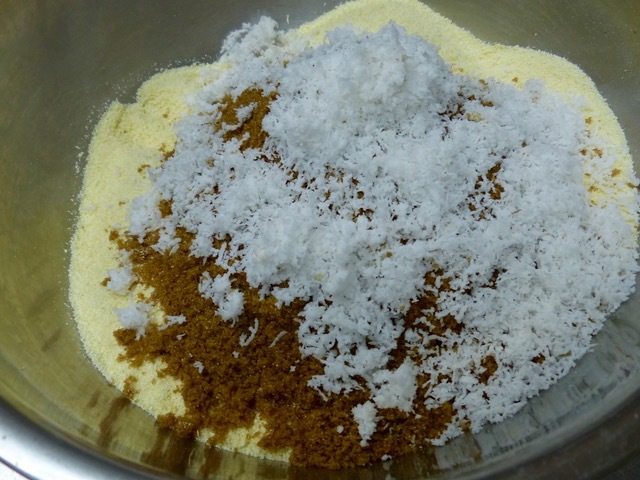 To the cassava flour add brown sugar (a nice deep dark brown sugar or muscovado that has been sifted) and some freshly grated coconut, not quite at its driest stage and not wet either. 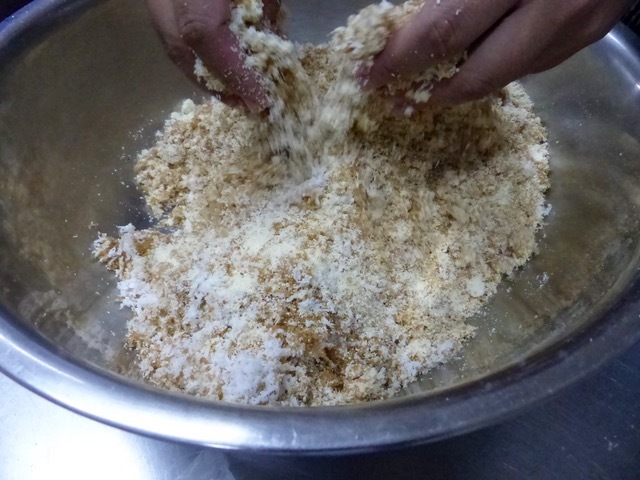 Meanwhile make some bukayo, which in these parts is large strings of coconut cooked with brown sugar. They look a bit like slimy worms but they taste wonderful. Now starts the interesting part. 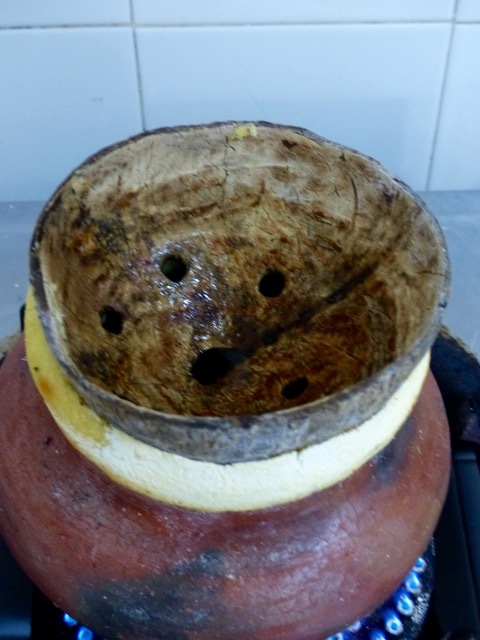 Place a small palayok over a gas burner (or charcoal of course if you like) then place a “bao” or coconut shell with large holes cut into the bottom and seal in the steam so that a sort of pressurized steam pushed up through the ingredients to steam a cake. I think this was a simple dough that was used to encircle the bao and create a seal. 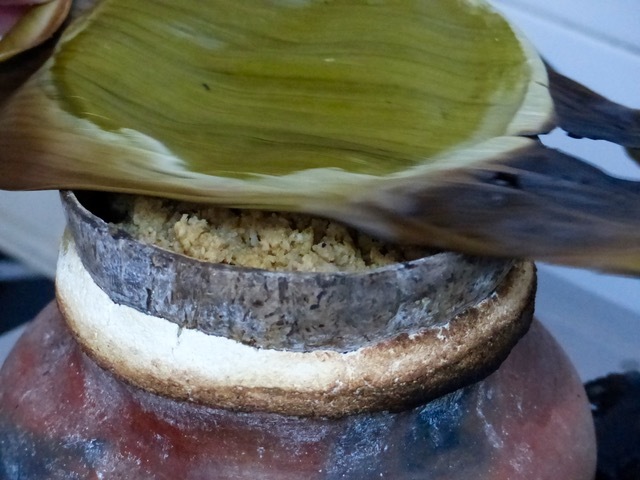 …cover with more cassava mixture and cover with banana leaves and top with something heavy like a pot lid and let this steam for a few more minutes. Just when you think that’s really simple, then you have to scrape the sides, and with two bamboo spatulas, you have to turn this OVER! and steam that side so it cooks evenly. Yipes. When it’s done, top with some latik and or more bukayo and enjoy. It was DELICIOUS, kind of chewy, moist and dry all at the same time. The texture of cassava is unmistakable, the flavor of coconut strong and it’s sweet. I don’t know why this isn’t available as street food in Manila. It wasn’t all that cheap, but it is oh so sustainable, local and right. We are still testing variations, trying to figure out a less labor intensive way of cooking it (though a lot of the charm is in the cooking vessel) like steaming batches in a normal steamer (doesn’t work as well so far)… so this is a work in progress. But I thought I should record this process so it’s on the net somewhere, lest I forget. I strongly encourage all readers to watch, learn and record special recipes and delicacies from your neck of the woods to help preserve these for future generations, even if, right now, you are shaking your head at finding this cooking vessel at your nearest kitchen store. Mastectomies! OMG, you beat me to it MM! I tried something similar but it was steamed in small Bear Brand Sterilized/Alpine cans with holes punched on the bottom. They were made thinner (probably half the can) and topped with bukayo. They were never turned over. SO simple and so delicious. Just make sure it’s cooked well to avoid cyanide poisoning! Steam them in banana leaf lined bamboo ala “putu bambu”. 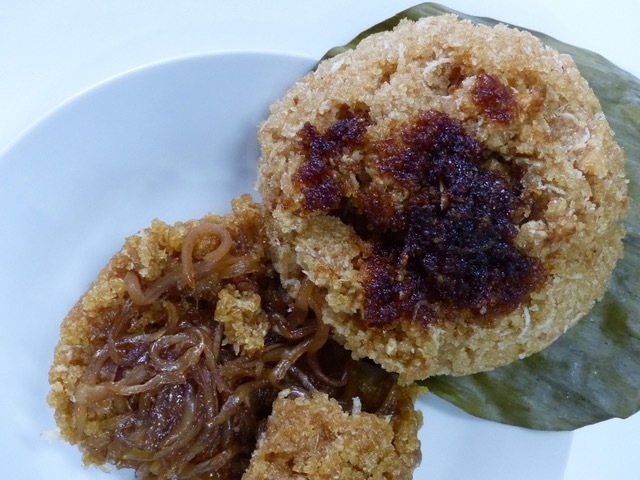 Here’s the general idea: http://www.normanmusa.com/recipe-dessert-putu-bulul.php Google “putu piring” or “kueh tutu” for more inspiration. I imagine recreating this marvellous treat in a modern steamer using small wire colanders as mold. 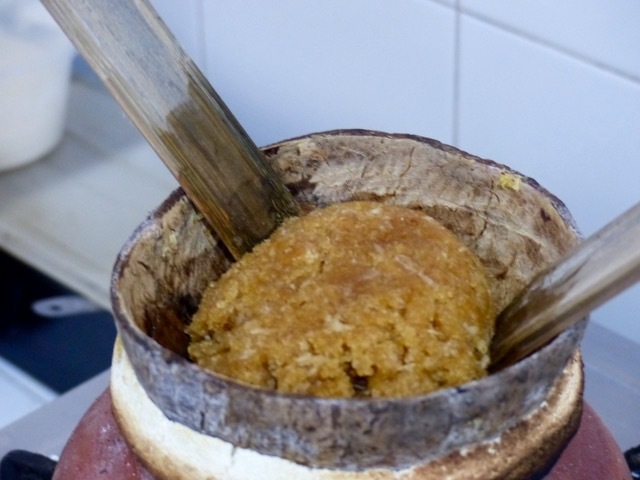 We have a similar treat down our way, not as buxom perhaps but still utterly delightful, using grated cassava mixed with glutenous rice and an even more colourful version (also popular in Pampanga) prepared with chunks of local squash, unpeeled with seeds included. Before tinkers devised the multiple-tube steam engines most of us are familiar with for steaming puto bumbong, the original set-up was similar to your coconut shell steaming cone, a single bamboo tube anchored in the centre of the smallmouth of a palayok with some soft material as gasket to stop steam from escaping. That looks like the popular street snack here clalled “puto taktak”. 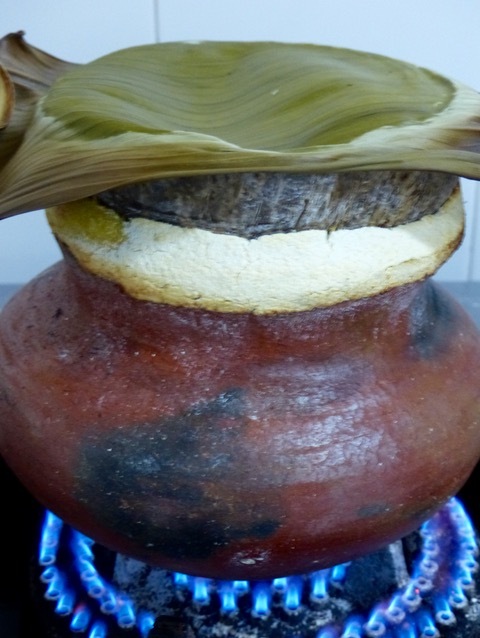 It’s cooked in halved milk tins and shaken out when cooked; thus, “taktak”. @Khew, O/T any tricks up your sleeves to avoid watery vegetable quiche and ratatouille? 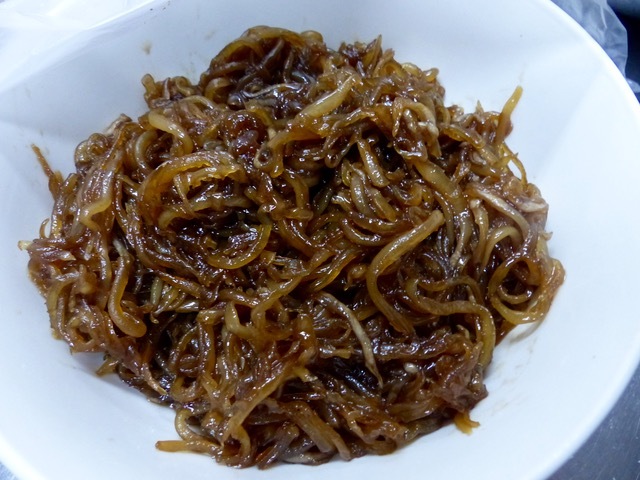 MM, you said the the bukayo looks like slimy worms. Apropos, reminds me of angulas, or gulas for those who can neither afford nor find the former. We have our version of cassava cake called puto lanson in Bacolod but it is a bit plain compared to what you made. My diabetic self misses bukayo. @Lee, would you please email me. Thanks. It’s been a while since I’ve eaten puto balanghoy. If I remember correctly when I was young, the puto sold was as big as the plastic cover of a Nescafé glass. 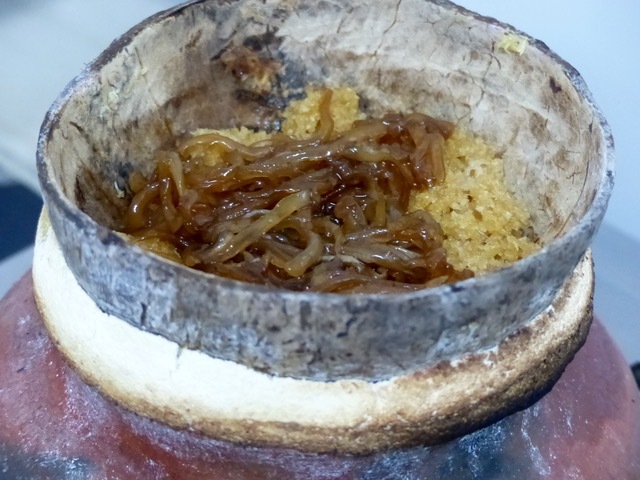 Another kakanin that I don’t see here in Manila is the one with banana, grated coconut and I don’t know if it has kamote which is made using a big wooden mortar and pestle. P.S. MM, I saw this “Place a small playoff” — palayok? That’s commonly called nilupak although Enriqueta David-Perez calls it lupok which sounds less violent to my ears. Yes, that is Puto Lanson, but without the bukayo. @Skye: Nilupak is available every Sunday at the Eton Centris Market except it is made of cassava rather than with banana. And yes, I haven’t seen banana nilupak . I sometimes make it myself when I have a craving using a small blender to yield a small serving for myself. MM, I’ve seen this as streetfood somewhere in Diliman and QC Hall. A man goes around carrying a tray piled with these, the tray covered in a sheet of plastic. 10 each last time I bought from him. But topping is a pinch of grated coconut, not bukayo. Will take a picture next time I see him. I like it because not too sweet. Footloose, nilupak (niluyang in Cebuano) was one of my childhood favorites. Just three ingredients: boiled green bananas, muscovado sugar, and grated coconut. There is this Filipino food take-out joint (in Toronto) that provided us with unhappy meals that offered one redeeming snack item, nilupak, only in their case, it’s a combination of saba and cassaba slathered with day-glow Star margarine. I’ve tried my hands on several versions of it though my family’s fave, by far, was the mix of ube and saba which proves once more that we are truly the people who love purple. @Footloose. Leeks, onions and spinach for a quiche can be dressed in oil and seasoning, spread on a tray and fan blasted in the oven for a few minutes, turning once or twice. Leave to cool down and use whatever liquid they might produce to offset the equivalent in cream/milk used for the custard. Same process for ratatouille but those types of veggies won’t end up leaking too much. Fry up your bacon + onions + garlic, add tomato paste (not puree), herbs and any veggie liquid. Once nice and melded, toss in the veggies and that’s it. No braising/stewing needed. Thank you so much, that was quick. MM, these cakes are still sold around here (Maasin, Southern Leyte). 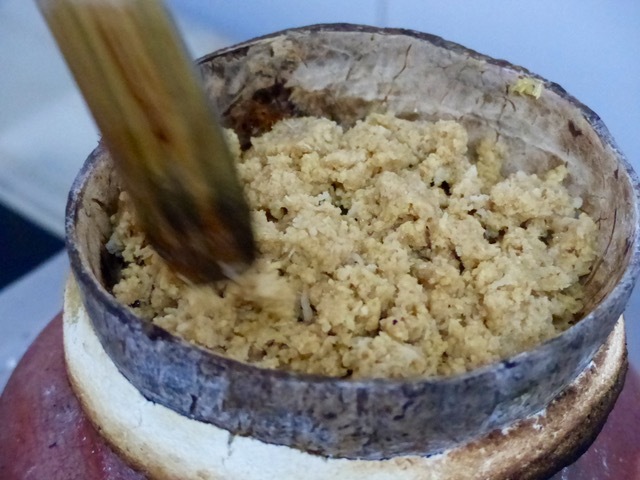 Me, I prefer my cassava simply steamed, with coconut cream poured over them at the last stage of cooking, then a sprinkling of brown sugar–goes very well with shrimp paste sauteed to death (itos is the term, I think) with lots of spices and tomatoes (and a bit of sugar). BTW, have you tried tostado? 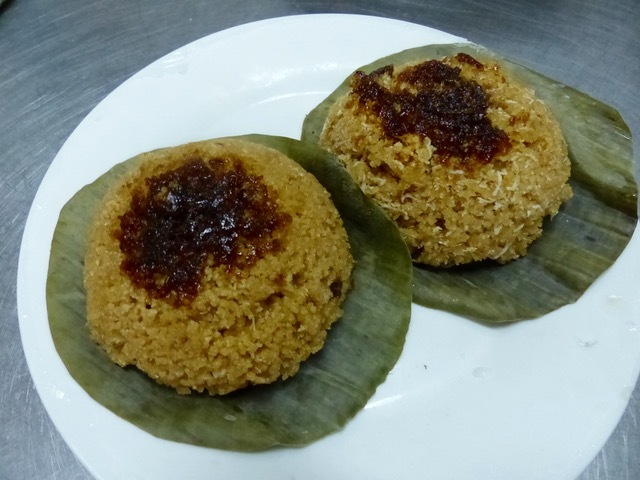 THey’re squares of sticky rice topped with a crispy layer of latik–my personal favorite among local kakanin. We call this puto lanson here in Iloilo. I remember buying it from street vendors in V. Rama, Cebu some 30 years back. It was a good snack at 3 pcs for 1 peso. Yum! Footloose…if you are up for another tip…in this heat, one can find me barbecuing outside instead of cranking up the stove or oven. I grill all the veggies I am harvesting such as zucchini coming out of my ears (ball zucchini in green, light green and yellow are the best for they are denser), carrots, sweet red peppers, onions and even tomatoes, seasoned with minced garlic, Montreal steak spice and splash of olive oil. For tomatoes, I smoke them lightly just to give it a smoky undertone ( makes excellent smoked tomato vinaigrette! ), corn. At any rate, using those grilled vegetables will elevate your quiches and ratatouille up a notch! But for ratatouille…I always have on hand Mrs. Marcella Hazan’s tomato sauce which I make in batches and freeze. I have a bumper crop of tomatoes again and started making her sauce and freezing them. However, when I make her sauce, I reduce it to almost half if I am to use it for pasta and sinigang! For ratatouille, I reduce what I need even further so the flavours are concentrated and not as watery. Then I add the herbs and grilled cut up vegetables. Hey Betty Q, we’ve been wondering about you although deep in our hearts we know that you’re just busy tending to your veggies when not into the woods mycoprospecting. I’m turning to Khew’s and your wise and learned counsel in anticipation of the harvest as summer ends. Hey BettyQ and ConnieC, how are you guys. MM, didnt think of anything about those last photos, till you said something. Hahhaha. Will tell my house assistant to try this technique. As for me, I’ll use the steamer basket that came with the rice cooker. Its a small size, so I think it will work. I got fresh banana leaves from my trees, and the Mexican grocery nearby sells fresh coconut and balinghoy. as a child, one of the things i looked forward to during lazy summer afternoons was the arrival of the kakanin vendor who made the rounds of our neighborhood. pag walang pera si nanay, the lady would pass unmolested. but if my mother had cash to spare, my sisters and i got to pick one item of kakanin each for our merienda. our suki’s wondrous wares included lanson, two pieces rolled up in banana leaves but without the bukayo. i realize now that given their shape, those twin lanson might have been cooked in milk tins as millet said. another native treat i like is bicho-bicho but not the dough bicho-bicho–i forget what we called that in our place–that is sold in manila; haven’t tried its equivalent (or so i’ve been told) here, carioca.